I am very happy to announce the release of HashTools 1.2. HashTools is a small utility that I use for generating hashes of files before and after I transfer them, to verify the integrity of the file. It can calculate MD5, SHA1, SHA256, SHA384 and SHA512 hashes. This updated released contains a few small fixes, and a change in the way it deals with hash files. Previously, you could create a file called "filename.sha1" (for example) that contained the SHA1 hash for your file (filename.ext) and HashTools would automatically load and compare the generated hash. Now, it will attempt to load a hash file with the name "filename.ext.sha1". I had to make this change to allow hash files to be created for files with the same filename but different extensions. Please feel free to contact me if you have any questions or comments. I would encourage everyone to update to this new version to take advantage of the many fixes and enhancements. Added an option: "Rotate wallpaper images automatically using JPEG EXIF information"
If you would like to see the full list of changes you can visit the DisplayFusion Change Log. You may be required to reboot when installing this update, because of the new DisplayFusion hook DLL. Not everyone will need to reboot, but if you are prompted to reboot DisplayFusion won't work properly until you do. I would advise everyone to update to this new version as soon as possible, as there are a number of important fixes in this release. Thanks everyone, and happy downloading! Head over to the DisplayFusion Languages page right now to download any of these excellent translations. I recently received a complimentary copy of Computer Bild magazine from Germany, and was pleased to see iTunes Sync included on their DVD compilation. There was a small write-up about it as well, and since my German reading comprehension is almost zero I'm going to assume they said nice things. I would like to send a big thanks out to Peter Kokkovas for letting me know that CPU Magazine had a write-up about DisplayFusion in this month's issue. They had some very nice things to say about DisplayFusion, which is always nice to read. Peter received a complimentary DisplayFusion Pro license for letting me know about the article. If you spot any Binary Fortress Software applications in print just contact me and I'll be more than happy to send a few licenses your way. You can find out more about this offer here. I am very pleased to announce the release of DisplayFusion 3.0! This release represents the most significant changes DisplayFusion has ever seen, and some of the most exciting new features. It has been 1 year since I released DisplayFusion 2.0 back in February 2008, and a healthy community has grown up around DisplayFusion since then. I have had many people submitting suggestions and others offering to help with testing and translations. As a result, DisplayFusion 3.0 has been under heavy development and community testing for the last 3 months, with over 50 people actively testing in 9 languages on every version of Windows from Windows 2000 to Windows 7 and everything in between. The single biggest new feature in DisplayFusion 3.0 is the addition of Multi-Monitor Taskbar support for DisplayFusion Pro users. This has been the most requested feature since DisplayFusion was released, and has also required the most amount of work to develop. Thanks to a significant amount of testing, the Multi-Monitor Taskbar support in DisplayFusion 3.0 is first-class and completely integrates with Windows. It uses the standard Windows Themes in Windows XP/Vista, and even works perfectly with hacked Windows XP themes that use a modified UxTheme.dll file. 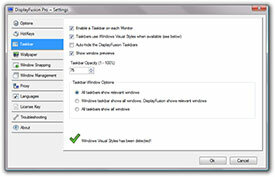 There are a variety of configuration options available for the Multi-Monitor Taskbar, allowing you to configure it exactly the way you want to. One huge benefit from community involvement is the addition of more language translations. DisplayFusion 2.2 was originally released with 3 languages, but I happy to announce that DisplayFusion 3.0 now has 9 supported languages and is constantly growing. DisplayFusion 3.0 is being bundled with 4 languages (English, French, German and Spanish) with 5 more available for immediate download (Italian, Swedish, Simplified Chinese, Dutch and Portuguese). When I released the first version of DisplayFusion with integrated Flickr support, I had every intention of adding more image providers at a later date. However, most wallpaper sites don't provide an API like Flickr, and as a result integration just isn't possible in most cases. 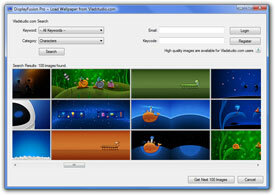 During the development of DisplayFusion 3.0 I was approached by Vlad from the popular Vladstudio website. Vladstudio has arguably some of the best wallpapers available for download, and all of the standard resolution images are completely free. The new Vladstudio wallpaper integration is free for everyone to use and allows access to the entire Vladstudio collection. People with paid Vladstudio accounts will have access to higher quality multi-monitor wallpaper, but free users aren't left out. Free users will have access to the same excellent images, just at a lower resolution. DisplayFusion 3.0 has also received a complete interface overhaul. Every piece of the interface has been revised and streamlined to allow for easier use. For example, the Settings window has been divided up into more tabs for better separation of configuration options, while becoming easier to navigate at the same time. The Wallpaper settings window has also undergone a transformation. With the addition of some excellent new image post-processing features (free for everyone to use) and the streamlining of the interface, it is now more powerful and easier to use than ever. You can do everything from applying a single image on one monitor to setting a random Vladstudio image to be spanned across all monitors. Everything has been simplified, but made more powerful at the same time. There are a number of smaller, frequently requested changes in DisplayFusion 3.0 as well. For example, the addition of a HotKey to change to a new random wallpaper image (DisplayFusion Pro only). Moving windows between monitors has been made even easier now, thanks to the addition of the new middle-click window movement option. When enabled, just middle-click on a window's caption bar and the window will be moved to the next monitor. Very easy, and much faster than dragging the window to the desired monitor. Of course, the old drag-and-drop window movement is still there, and has been enhanced to provide better application compatibility. DisplayFusion 3.0 also introduces a special game detection feature. When a game is starting up DisplayFusion will suspend all background operations to free up maximum systems resources for your game. Once you exit the game, DisplayFusion will resume everything automatically without you having to touch anything. As always in any big release there are dozens of bug fixes as well. 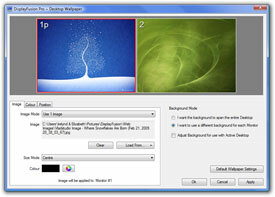 DisplayFusion 3.0 includes some fixes that apply to wallpaper centering, mouse lag, HotKey bindings and much, much more. I would encourage everyone to update to DisplayFusion 3.0 today. If you have the auto-update option enabled you will be prompted to update the next time you start DisplayFusion. If you don't have auto-update enabled, just head over to the DisplayFusion page to download the new version. DisplayFusion Pro users don't need to worry, your existing license will work with DisplayFusion 3.0 and all future DisplayFusion versions. I would like to send out a big thank you to everyone who helped to make this release possible. From the people who submitted suggestions, to the people who helped translate and test, you all made this release possible. Thanks to Hui Liu and Wang Hao. You can find these and more languages on the DisplayFusion Languages page. Thanks guys! I am very happy to announce the release of ASP.NET ViewState Helper v1.2. This release is a very minor update, but includes some long overdue functionality. Whenever the ViewState fails to decode and you get the infamous "The serialized data is invalid" error, this new version will provide you with more troubleshooting information. Thanks to a tip from "pista7" in the Support Forums, ASP.NET ViewState Helper will now tell you a more specific reason for the decoding failure. For example, you might be missing a 3rd party assembly that is required for deserializing a value. I would recommend all existing users of the ASP.NET ViewState Helper upgrade as soon as they can to take advantage of this new feature. This has turned out to be a substantial new release. With the numerous bug-fixes and tons of new functionality, this is shaping up to be one of the biggest DisplayFusion releases ever. If you want to use DisplayFusion Pro on more than one computer, this is an excellent way to purchase multiple licenses and save some money at the same time. As always, I would love to hear any feedback you have about any of these changes, or anything in general. You can use the contact page, or you can find me on Twitter. Thank you for your continued support, and I look forward to hearing from you. I would like to send out a huge thanks to Marko for translating DisplayFusion v2.2.1 into French. If you are interested in using DisplayFusion with a French interface just head over to the DisplayFusion Languages page and download the French language file. For more information on how to install the language file, look at the "How do I use these language files" section on DisplayFusion Languages page.